Ford is reporting strong sales growth in hybrid and plug-in hybrid cars, validating their Power of Choice strategy which aims to grab market share from Toyota and Honda. Ford Motors is reporting strong growth in sales of their line of electrified vehicles, especially in California. Total sales for August of 8,292 cars is up 288 percent since August 2012, when their Power of Choice strategy was still just a marketing presentation. Ford's Plug-in hybrids, the Fusion Energi and C-MAX Energi, both are selling strong, and Ford has pledged to bring the Power of Choice concept to Europe beginning in 2014. Ford's Power of Choice is a strategy of giving their customers the ability to choose their desired drive train. In the abstract it means that every car in Ford's lineup will be available with gasoline, or diesel, or turbo-charged gasoline, or hybrid, or plug-in hybrid, or electric drive trains, with the customer ticking off the desired box while configuring their car. Today the vision is incomplete, in that there isn't a full range of drive train choices for every car in Ford's lineup. It wasn't until the late fall 2012 that Ford began rolling out models under the Power of Choice strategy. While it's exciting to see a 288 percent growth year-over-year, most of the cars for which Ford is reporting sales figures weren't even on sale in August 2012. It's also exciting that Ford sold a total of 8,292 electrified cars during August, but that number is small against Toyota's sales of electrified cars. Toyota sold 8,100 Prius's in California alone during August 2013. Ford is specifically gaming to grab market share from Toyota with electrified cars, hence they have a ways to go before reaching parity with Toyota. Ford sold 1,221 units of their two Plug-in Hybrids, the C-MAX Energi and Fusion Energi, or about 600 apiece. During the same period, Toyota sold 1,791 Plug-in Prius's, and GM sold 1,791 Chevy Volt's. Ford's Energi's have been on sale only since last Winter, while both the Plug-in Prius and Volt have been on sale for much longer. 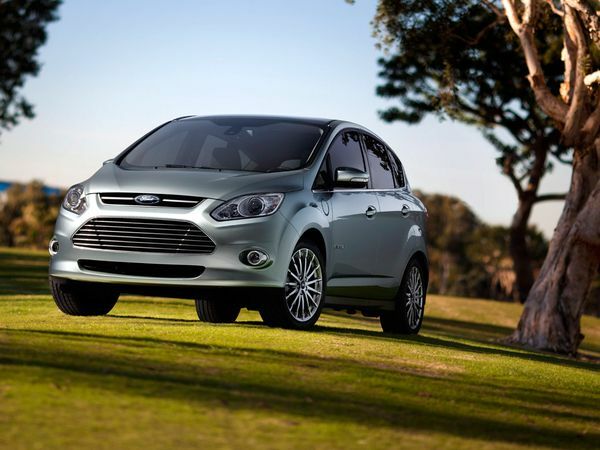 The Ford C-MAX Hybrid sold 3,032 units for a 12% gain over July sales. Nearly 2/3rds of Ford's electrified vehicle sales are coming from what they call "conquest buyers", or people who traded in other car brands to buy a Ford. The highest on the trade-in list was the Toyota Prius and Honda CR-V.
Another strategy point for Ford is capturing market share in California, a market where Toyota and Honda are both strong, and where electrified vehicles are highly valued. Ford claims that C-MAX Hybrid sales accounted for 30% of their sales growth in the west. Nearly 50% of the Energi's sales were in California. In Europe, Ford is already selling the Focus Electric, manufacturing it in Saarlouis, Germany. That car will be joined by the the new C-MAX Energi plug-in hybrid and the Mondeo Hybrid. The C-MAX design was already on sale in Europe before coming to the U.S. as an all-hybrid line. "Our dealers continue to tell us that the C-MAX Hybrid brings new customers to their showrooms, customers who previously hadn't considered a Ford vehicle," said C.J. O'Donnell, Ford electrified vehicles group marketing manager. "Customers love the outstanding all-around package that the vehicle provides, all while getting class-leading fuel economy."